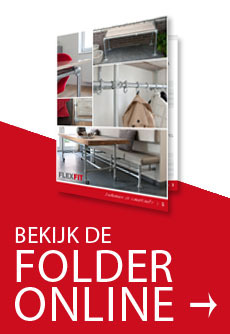 FlexFit is a Dutch quality brand of metal galvanised tube clamps and tubes, founded in 2008. With Flexfit you easily design your own furniture, all according to your own ideas. With our tubes and tube clamps you create, for example in combination with scaffold wood, attractive furniture, with an industrial and tough appearance. Because of multiple possibilities, your creativity can run wild and you can develop unique furniture and constructions. Dining tables, chairs, coathangers, cupboards, nightstands, the choices are endless. Our products are on top of this, because of the robust quality, very suitable for applications in gardens. Flexfit tubes and clamps withstand all weather.